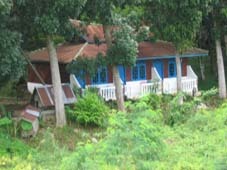 Bukit Lawang Indah Hotel is located on the other side of the river via the large suspension bridge. They have a large restaurant which serves excellent food. 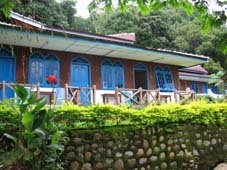 Bukit Lawang Indah is a lovely place to stay! The guides all work on a freelance base and are not working together with the hotels. If you had a bad experience with one guide don't blame the hotel where you met him. 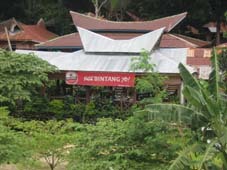 Indah is famous for the good kitchen, affordable rooms, the fun nights with live guitar music & singing and the friendly people. It definitely makes your stay in Bukit Lawang unforgettable! I stayed at Bukit Lawang Indah Hotel and I left disgusted. The guide of the Gunung Leuser National Park who works for this hotel, called Amar, is very dodgy. He makes up excuses (as someone in his wife's family has died) to return earlier from the treks. Amar scammed, he charged me 50,000 Rp extra. When I realised and I asked him the money back, he said "Yeah, I have scammed you and robbed you, but that is ok"
Have you stayed at Bukit Lawang Indah Hotel?